Today's Discussion is sponsored by U by Kotex, regardless all opinions expressed below are my own. Let's be frank, we all know during that time of the month most women tend to be a little moody and many are experiencing quiet a bit of pain. While there's really not much you can do about mother nature, being spoiled with a gift basket full of useful and comforting items is the perfect way to help ease the pain or at least distract from it a little. Aunt Flo is such a pain, this gift basket with U by Kotex is just what the doctor ordered. Head on over to the store, grab everything on this list and relax. Whether you're the boyfriend trying to help cheer up your girlfriend (brownie points!!) or you just feel like treating yourself to these goodies, I guarantee you'll love everything about being spoiled with these little delights! 1. Protect From Leaks - Grab a pack of U by Kotex - Security Ultra Thin featuring 3D Capture Core and never worry about leaks again. These super thin pads quickly draw in and lock away wetness, leaving for a clean feeling with super-soft sides for your comfort! All the U by Kotex products are awesome, you should really try them and lucky for you, they are giving out FREE samples! 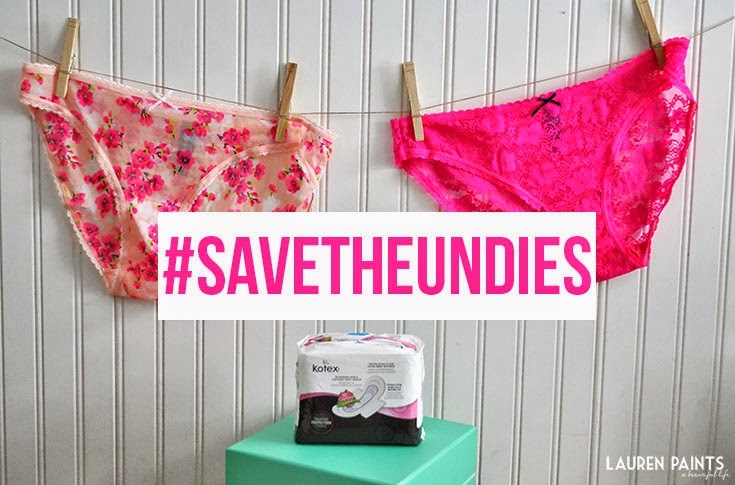 Score an awesome #SaveTheUndies free sample today! 2. Go Herbal!- I swear by herbal therapy. Packs filled with a special stress-relieving aroma-therapeutic blend of herbal essences, these little babies are designed to calm and comfort both the body and the mind. 3. Eat All The Chocolate - Sweet treats like candy bars, cupcakes, etc will satisfy cravings and make for a happier girl! Especially if you grab dark chocolate - it's actual good for you! 4. Stay Watered - Grab something hydrating with vitamins. I personally love Propel or Vitamin Water. Each girl has her own drink. Remaining hydrated is important, no matter what time of the month it is! 5. Get Polished - Painted nails don't really seem like something significant, but having a nice mani-pedi is the perfect way to add a polished touch to the yoga pants & t-shirt wearing look. 6. Comfort is Key - Buying new comfy clothing is an essential part of feeling comfortable during this time of the month. The softest sleep dress you can find and cozy undies are the perfect apparel while cramping and just hanging out around the house. 7. Catch a Flick - Grab a rom-com, a cheesy girly movie, or a feminine classic and spend the evening relaxing with all the new goodies while watching the movie and cuddling! While this basket may not relieve the pain entirely, little surprises like this are always appreciated and may help distract from the aches a bit. I actually love giving baskets like this to my friends that just gave birth as well, it's such a creative way to give a new mommy something special made just for her. No matter who you plan on giving a basket like this, be sure to add some U by Kotex! What other goodies would you like to receive in a gift basket?